What's It Like To Be A Minimalist With A Baby? Check Out Our Minimal Baby "Room"
You know how, when you have a baby, you are bombarded with options? I feel sorry for first time parents these days, there is so much that is marketed as “needed” and we feel the need to research everything- pacifier types, diaper brands, bottles, toys, bedding- oh the list is endless! I’m here to tell you that you don’t need it. There are some things that can help us, but the majority of things marketed to parents, just take up space. Babies don’t play with all those toys on the exersaucer- unless you count 10 minutes a week as “play”. I don’t! For me, a successful baby item is one that we use daily. If my little one has a toy and never plays with it, we let it go. Our youngest is one year old and currently still sleeping in our room. He’s sleeping through the night now, so soon we will re-arrange the kids rooms and he can join his older siblings. Keeping baby equipment to a minimum has been super helpful and it means that our home doesn’t feel like a day care center. Most baby gear isn’t needed and doesn’t make our life any easier. We use a pack ‘n play for his bed, it takes up less space than a typical crib and when we travel, we just take his bed with us. We use a white noise maker when he sleeps. Our home is small and we have a big family, which means there is noise. All. The. Time. The white noise helps him sleep through the typical noise variety that goes on in our home. The clothes, diapers and extra bedding (1 sheet, 1 mattress pad, 3 blankets) are in his dresser and I keep a changing pad (only 1 cover) on top. Not needed, and for many years I changed a baby on our bed, but the changing pad makes my life easier. The diaper bag hangs by the front door. We have a small box of toys and books (I like Sandra Boynton Books), but most of the time he’s trying to get into his older sibling’s toys or anything else he can grab and investigate. The car seat stays in the car all the time. We do have a stroller in the car as well. I use a wrap for the whole first year and now we use a stroller when going to the library or farmer’s market. We use a backpack carrier for hiking. For the dining room we have a wooden high chair, without a tray- we just pull it up to the table. Bottom line: Get the things that you find practical, which often is only realized after baby is over 1 month old. Click here to see what I have for newborns. This post is helping answer MY question! 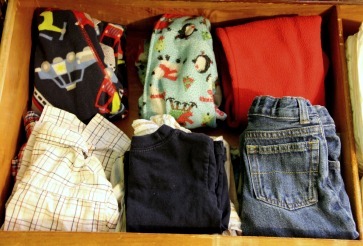 My husband and I are not close to having children yet, but I’ve been wondering whether kids bring clutter. Thanks for writing this thoughtful piece. Our youngest of 6 is 1.5 years old and we have about the same list as you for toys! The clothing is the next thing I’m going through. We get tons of hand me downs and I’m terrible about weeding them out into a reasonable amount. I’m on a roll now though! Overall, I agree. 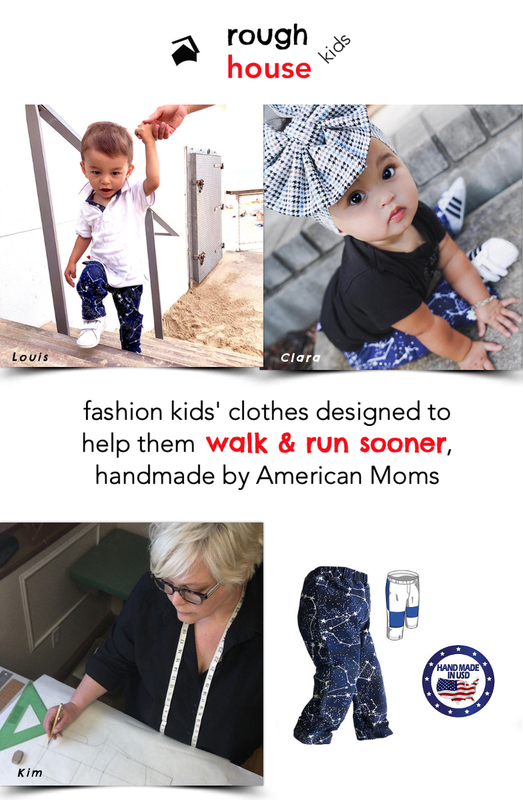 But based on your list, it looks like you only have 5-7 days worth of clothing for your tot. That means more frequent laundry. I can’t always get the clothes washed once a week, so I find it helpful and less stressful to have at least a week and a half worth of clothes or even two weeks. 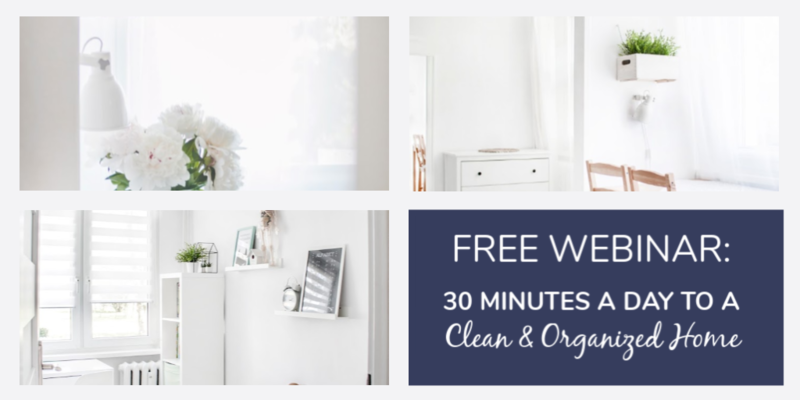 Less clutter = less stress, right? In this instance it’s more stressful to do more frequent laundry so I choose to have more clothing. Our home feels the same on this one. we have certainly slowed the influx of purchasing, and we often buy consignment, but in this case, we prefer to have more time between laundry days. excellent! this is a post many parents and soon-to-be parents need to read. my children are almost 5 and 26 months and looking back on it, i know we had way too much stuff. we live in a 2.5 bedroom condo, and i thought i was doing “a good job” keeping the extras to a minimum. i was wrong. i have been downsizing for the past 4 months and will continue to do so weekly b/c it just feels right. however, i wish i hadn’t accumulated so much to begin with! I wish I had known a lot of this when we had our daughter. However, we were, lucky for us, strapped for cash when she was born, so we didn’t end up with a lot of stuff, thank goodness. Clothes came from eBay, minimal toys, etc. We used everything until it fell apart. The only thing that we did buy and never use was a port-a-crib – she just hated it! Her exersaucer on the the other hand – she LOVED that thing. She would bounce it and spin around to see everything – I think it contributed to her natural athleticism later on! LOL! Great post – I couldn’t agree more. I read in a Harvey Karp book that your child expects to be brought home to a cave. I let that philosophy guide my purchase decisions when getting ready for my daughter as we lived in a tiny apartment and didn’t have much space. Love your site and posts. Keep up the great work. If it’s a boy Grandma will go shopping for some clothes but even then I have enough gender neutral sleepers for the first little while. I don’t want anyone to give me anything! We have 3 kids. My children never had a fancy nursery or a crazy amount of toys. I really feel that it is a waste. All 3 my kids slept next to our bed in a crib for the first year, if not longer. My youngest is 2 years 7 months and she only recently moved into her own room. We are planning on baby #4 and we will be buying again only the bare minimum. The only thing I will be splurging on is a Mamaroo rocker. I’m glad I came across this article. Ive always tried to be a minimalist, without really knowing it. Ive always gotten feusterated with clutter and having so many things; especially clothes. It wasnt until recently that I discovered the term minimalist (project 333 & the like) and, now that I have some resources to help me stick with it, Ive decided to go full swing with minimalism. I have a ‘almost’ 6 month old baby boy, and I’ve been thinking about how I can minimalize all of his things. Before he was born I was so stressed out trying to make sure we had everything we needed; crib, cosleeper for our room, pack and play, stroller, baby carrier, toys, books, blankets, bath supplies, etc. it wasn’t until he was about 1 month old that I realized we didn’t need most of it! I wasn’t planning on it but I ended up co sleeping from day one, so his co sleeper was never used, and his crib is still not set up. I only used to pack and play to put him down when I was doing chores, etc. I only used the stroller once because I find our baby carrier (bardered on a facebook yardsale group) more convenient. And clothes…. Oh boy, did we have too much (100% hand me downs & second hand though). Now that we are nearing the end of his hand me downs I’m going to try to keep a minimalist wardrobe for him, and continue to buy second hand, as I do for myself. It is going to make my life as a mother so much easier! Thanks for the article! It makes me more co fident about moving forward on my minimalist journey. We were NOT at all minimalist with our first child. But, honestly, she absolutely LOVED the Exersaucer. It was well worth having. She also loved the swing. If I could go back in time and be a more relaxed Mom, I could’ve slept for hours on the couch while she slept in the swing nearby. 🙂 She slept in her own crib in her own room nearly from the beginning. By a few months, we put her down (happy and awake) and she slept all night, then awoke in the morning (still happy). She was a dream child. LOL! We were much more minimalist with our boys because we lived in smaller dwelling when they were born. When our first son was born, we lived in a small apartment on base in Japan. Most of our things were in storage, so we had much less “stuff” with him. When our second son was born, we were living in a 2-bedroom rental house in Hawaii. Had we known our 3rd child would essentially hate everything except his Momma’s arms, we could have been very, very, very minimalist with him. LOL! This post is soo true! I fell into the baby not so essentials since I am a first time mom. We started out using the pack n play now he is in bed with us because he won’t sleep in it anymore since he started rolling. 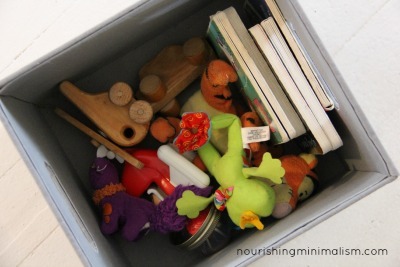 I think the key is knowing what is sentimental and what’s not when decluttering. I started organizing and decluttering by gifting the non sentimental to friends and family with soon to have newborns. It is true nowadays you do have to research but it’s much easy with smartphones n such. I’m glad that I’ve found this post. I’m a soon to be first time mother. And I’m on the younger side(24.) I’ve been catching so much “crap” from nearly everyone I know, for my registry. Apparently, I just don’t have enough of the “essentials” on my list. My list mostly consists of baby wash, diapers, bottles, a baby wrap or two, and a diaper bag. I don’t see how those things aren’t the essentials. I already have MORE THAN ENOUGH furniture (crib, rocking chair, changing table with drawers that doubles as dresser, stroller with detachable carseat.) Plus, I didn’t even want the shower. We’re definitely not high rollers by any means, but I find the idea of a shower to be almost insulting. Also, I’ve realized that it is on RARE occasion that babies play with an expensive toy more than once. Yes, I do plan on carrying my baby for most of his awake hours. No, I don’t need more clothes. Yes, I do prefer a neat and organized home. No, I don’t think that that will drastically change after having a newborn. Furthermore, I’ve neverrrrrr been known to be very materialistic, so the fact that nobody saw this coming/can’t just let it be by now , just blows my mind. My apologies for the rant. I’m just sick of people holding worthless items to be of high value, especially when a child could(and rightly should) care less. I love your honesty! I do not want a shower either. I don’t have kids yet, but I know that I don’t want tons of stuff because it just doesn’t make sense to me that a baby could possibly need all of the things that people swear they need. I’m not opposed to buying things I’ll need, but I want to get what my child will need. I want to get to know my children and cater to their needs as they arise. I read in another blog that people who over provide for their kids simply make needy kids. 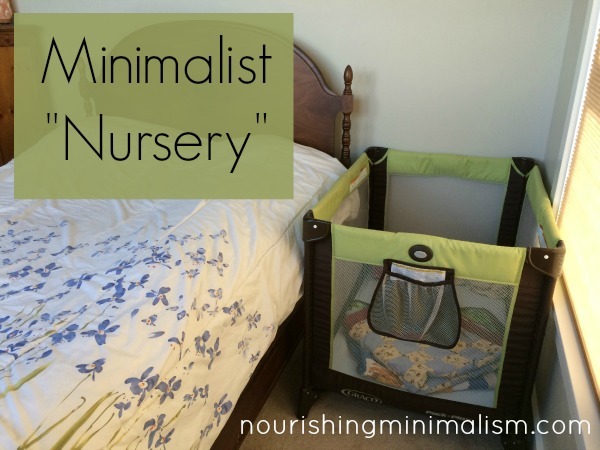 It was so refreshing to me to find people who had a more minimalist approach to babies. Honestly, it wasn’t until then that I even warmed up to the idea of having kids at all. It wasn’t appealing to me to have to have all of that stuff! But now I feel free to do things the way my husband and I want to, not the way everyone else says we have to. Finally a post that actually helped. Thank you.